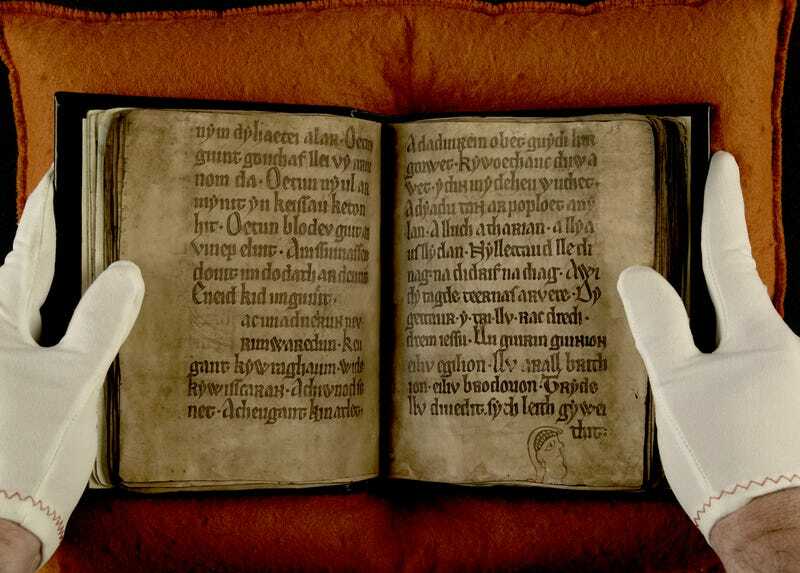 The Black Book of Carmarthen, named for the color of its binding and believed location of origin (the Augustinian Priory of Saints John the Evangelist and Teulydog in Carmarthem), is the oldest surviving manuscript written in the Welsh language. Excluding a few passages on the horses of great Welsh heroes, the book mainly contains poems dating from the 9th to 12th century – including the first written tales of Arthurian legends — all of which were chronicled by a single, unknown scribe in 1250. These include a conversation between Merlin and Taliesin and one of the very first appearances of King Arthur in known literature (in which he sings praises of his men in order to gain admittance into a castle!). The original owner of the Black Book was believed to be Sir John Price of Brecon, who came upon the volume after he was sent by King Henry the VIII to loot ruined monasteries. Since then, the book has passed through many hands, including a 16th century gentleman believed to be Jasper Gryffyth, who felt it best to erase each mark written by previous owners in the book’s margins with a pumice stone. Now, with the aid of UV light, PhD student Myriah Williams and Professor Paul Russel of the University of Cambridge have spent the last three years uncovering these mysterious etchings from the book’s animal skin pages – and revealing hordes of ghostly doodles in the process. Among the drawings, they’ve unearthed the heads of beasts, illustrations of fish, and a poem not previously recorded in the Welsh canon. Among the writings, the researchers discovered an inscription suggesting the book was gifted to a family member – and possible criticisms of the text itself. The National Library of Wales has digitized the entire manuscript – which you can browse page by page, right now, at their website. Although no translations are currently available, the uncovered notes and scrawlings are now eminently legible on the first few pages of the legendary Black Book.